As a marine hobbyist, I have always developed the knack and interests to try out new stuff and that includes keeping live lobsters which I got from the supermarket seafood section as pets. Although that might sound absurd, the whole experience turned out to be fun and entertaining and the group of 3 which I initially bought had actually survived for years, one died after only a month while the other 2, both lived for years (the longest almost 5) until he died of a suspected outbreak of disease. But before I start it off with my pet lobster journey, let’s begin to try to understand more about this creature and its characteristics. The Marine Lobsters often seen sold at supermarkets (rather than pet shops) which are meant for consumption at the dinner table are actually part of a large aquaculture industry, cultivated around the world due to its economic value. 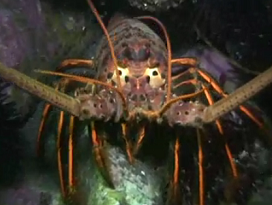 There are different types of the lobster family commercialized and bred in large scale whereby one of the most commonly found is the Nephropidae lobster rather known as the true lobsters with claws while the other one is a variant of the spiny lobsters which belong to the family Palinuridae, sometimes called the rock lobster or known as marine crayfish. There are other lobsters families are loosely categorized into their own grouping and some of it not really made known to aquarist. Just like myself, there are quite a number of people who actually showed interest in keeping the lobster as pets in their marine saltwater aquarium, not for food consumption but mainly as a display specimen. Keeping the lobster is not really something that requires special skills because as long as you have the basics of marine fish keeping like how to prepare the saltwater, that should be enough to ensure that they survive. One of the few things in mind before you get started, just make sure that you have a very large tank (minimum 100 gallons) and anything smaller than that will mean suffocating and causing increased level of stress and competition among your pets. If you have reef aquarium, stay away from putting those two together at all cost as the lobster will damage all the corals while small ornamental fish will ended up getting killed. Thus, normally a barren empty tank would be sufficient and if you decide to decorate things up a little bit, consider getting the artificial marine tank decoration which looks quite nice as well. In order to ensure that your lobsters survive, the tank to keep your pets should be equipped with a working chiller as you need to maintain the water temperature at the lower range, at least below 15 deg Celsius. Try to avoid putting your juvenile lobsters into tiny cramp space because they are known to show aggression when confined in this condition and will fight until they get injured or lost their limbs. I had mine kept in an 80-gallon tank before I upgraded to 120-gallon because the bigger one was constantly picking on the smaller lobster. The tank facility need not be something which is high tech and a simple setup equipped with a sump system and a protein skimmer should be sufficient. And basically throughout the years, there wasn’t any problem at all as the maintenance routine was generally not demanding as I only need to change the water once every week. The filtration system will take care most of the cleaning process and since the lobsters are also scavengers, generally you won’t face many problems with leftover foods getting rot and contaminate the water. Thus just make sure that you feed the right amount of foods enough for their daily needs. Lobsters are not picky eaters and they will accept anything that you give to them as foods like chopped fish meat, market prawns or even shellfish will be fine. In the wild, they will eat just about anything like small fish which they are capable to catch on their own, sea urchins, clams, shrimps, starfish and whatever they could scavenge. Although they have very bad eyesight, they actually could locate their foods using the antenna which works like a bio sensor or receptor to pick up the chemical agent present in the water. Like all crustaceans, in order for them to continue growing they will need to molt leaving the eerie-looking empty exoskeleton behind. Thus every once in a while, you will need to pick up the unwanted stuff and discard it. One word of advice when putting your hands in the water is that make sure you don’t get your fingers clipped by the claws or else, it will hurt a lot. I had my bad experience once and learning from it, after that I only use plastic rod or pipe to pick up or move items in the tank. Although you can easily ensure that your lobster survive in the home aquarium condition, that should be the limit on as far as your pets hobby should go because if you have thoughts about raising them for sale and commercialize your venture, then you should just drop the idea because these crustaceans are best left to the experts in the aquaculture industry. Main reason is that lobsters are known to take a long time to reach maturity stage and you will also need to control and minimize your cost in order to make a return. Don’t forget, maintaining your chiller is one of the biggest obstacles as the cost of electricity will eventually cut into your profit. If your idea is to keep it simple and still having a pet lobster, then you should instead go for the freshwater crayfish instead which is much easier to handle than its marine cousin. Looking for something new for a change? How about adopting seahorses as pets?